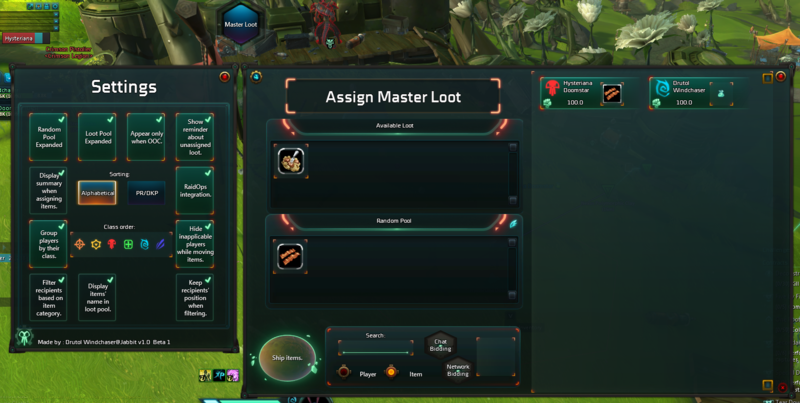 Different approach to Master Loot. This is a side project and I'm looking for feedback whether somebody like this approach. * If items are left in the random pool they will be distributed at random piece by piece. You can filter what goes to random pool by pressing blue button on the right of this container. Each item can be drag&dropped between pools , recipients and action slot (for bidding - requires main RaidOps addon). When you have finished moving items where needed just press 'Ship items'. There will be small summary(depending on settings). Addon has built-in 'NotNowMasterLoot' functionality. Write your thoughts in the comments or here on github!